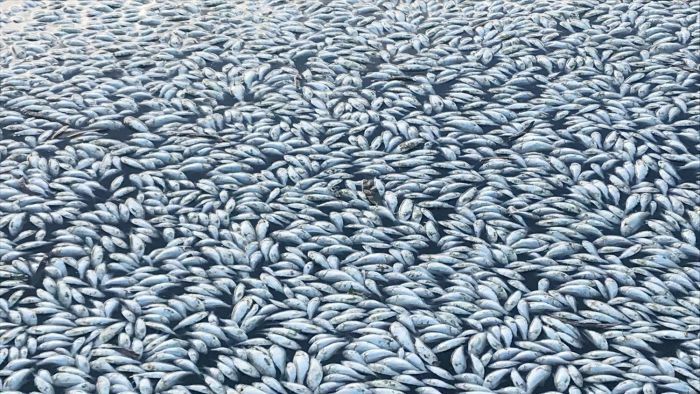 NSW Regional Water Minister Niall Blair says the latest fish kill in Menindee is “out of the Government’s hands” as locals wake to shocking images of hundreds of thousands of dead fish in the Darling River. Mr Blair will travel to the drought-stricken town of Menindee today to meet with experts and clean-up crews working to remove decomposing fish from the river banks. The town, which is an hour’s drive from Broken Hill, has been at the centre of a continuing ecological disaster — yesterday’s discovery marking the third fish kill in less than two months. Mr Blair told the ABC his Government was out of options after the “band-aid solution” of installing aerators along the river failed to keep fish alive. “If there was something else that could be done we would have done it,” he said. Earlier this month, up to one million fish died in the Darling River at Menindee when a blue-green algal bloom removed oxygen from the water. The fish in the water suffocated. Sudden temperature changes as well as rainfall are known to worsen blue-green algae blooms which have infected parts of the Darling River. Mr Blair said Menindee had experienced a long period of hot weather, but when the temperature dropped by 20 degrees Celsius on Sunday, the fish did not stand a chance. “That’s out of our hands,” he said. Poor water quality in the Darling River at Menindee has sparked health warnings, with many locals forced to buy fresh water. People in the outback town blame the Murray-Darling Basin Authority’s decision to empty the Menindee Lakes in 2014 and 2017 for the dire state of the area’s waterways. Mr Blair said the NSW Government was still assessing the first fish kill on December 15 and would use expert advice to devise an “appropriate recovery plan”. “We knew that our aerators were nothing better than a band-aid solution, but we were willing to try everything that we could,” he said.